A major defoliator of all deciduous trees the Forest Tent Caterpillar prefers trembling Aspen, Sweetgum, Oak, Birch Ash, Maple, Elm and Basswood. This insect does not form a tent in the usual sense. Larvae feed in groups without making any webbing. 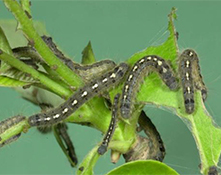 The larvae construct a silken mat on the trunk or a branch of the host tree. From there they forage in all directions but begin by concentrating on one branch at a time consuming expanding flower and leaf buds. After buds open larvae feed on the foliage. The egg masses encircle twigs and are coated with a varnish like substance and square at both ends. Overwintering takes place as a fully developed embryo inside the egg shell. 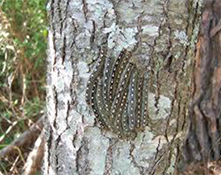 When they hatch, the larvae tend to migrate high in the tree where they feed on expanding flower and leaf buds. They are gregarious during the early stages and at molting time they form the silken mats usually on the tree trunk. There is only one generation a year. 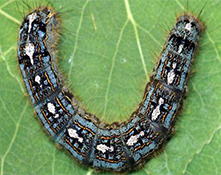 The Forest Tent Caterpillar is easily distinguishable by the series of keyhole-shaped spots along its back. Prune out egg masses when trees are dormant. Bacillus thuringiensis (BT) provides control.